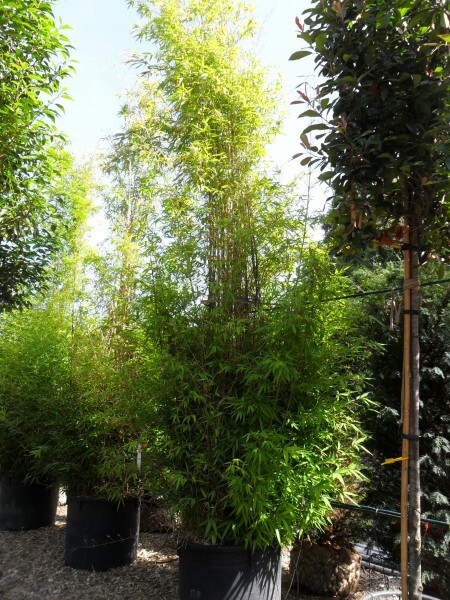 This Bamboo is commonly known as Golden Bamboo or Fish-pole Bamboo. It originates from China in the 1870s and has taken well to growing in British gardens. This attractive plant is perfect as screening or for ornamental purposes. The canes grow in clumps which are bright green at first, maturing to a pale yellow. Canes can grow up to 3 cm in diameter, have protruding nodes and are leaved nearly from the stem. The leaves, which grow on short petioles, are elegant, pointed and thin. They are a bright, fresh green on top, with a slightly bluer colour underneath and grow up to 18 cm. The RHS has given this tree an Award of Merit.